By the advent of the revolutionary government in 1959, Cuba had a dynamic banking sector, with a growing domestically-owned bank sector and foreign owned banks which had operated in Cuba for several decades. The Cuban National Bank, the central bank, had been established in the early 1950s. The revolutionary government nationalized the banks in October 1960, and eventually most commercial and central bank activities were, following the model of the Soviet Union, concentrated in the Cuban National Bank and a few state banks until the banking reforms implemented in the mid-1990s.2 In May 1997, two important banking laws were passed, which created a new institution for central bank functions, the Central Bank of Cuba, and provided a broader basis to create state-owned commercial banks and other nonbank state-owned financial institutions. Despite the legislation allowing the creation of financial institutions and the improvement in the availability of financial instruments since the mid- 1990s, the banking sector in Cuba has not developed sufficiently to play the role that it could play to support economic growth. Cuba remains a seriously under- banked economy. The first section of this paper discusses the current banking and monetary situation in Cuba, including a discussion on the existence of dual currencies and multiple exchange rates. The second section analyzes the monetary, credit, and exchange rate guidelines of the Sixth Party Congress in the light of Cuba’s banking problems. The last section provides policy recommendations to modernize and develop the banking sector in Cuba based on international best practices. In 1997, at the time of its creation, the CBC was assigned the typical functions of central banks: issuing domestic currency; ensuring price stability and a well functioning payment system; licensing and supervising financial institutions; and being the fiscal agent of the state and the manager of international reserves. A Monetary Policy Committee was created within the CBC, which analyzes monetary data that have an impact on inflation, including foreign exchange transactions by the official foreign exchange house, CADECA, where Cuban residents can buy and sell foreign exchange. There are two domestic currencies in circulation in Cuba today, the Cuban peso (CUP) and the convertible Cuban peso (CUC). Box 1 has information on the CUPs and the CUCs and the prevailing exchange rates. The characteristics of Cuba’s centrally planned economy have important implications for monetary policy. State enterprises are not completely autonomous in their investment and production decisions. The decisions regarding their production levels not only react to the level of prices and other commercial considerations, but also to political decisions taken in the national plan. Furthermore, state enterprises are assigned foreign exchange allocations. For this reason, in Cuba, monetary policy in terms of trying to regulate the growth of a broad monetary aggregate refers more to the monetary conditions of the household sector.4 However, there are obviously monetary connections between the state enterprise and the household sectors, and the decisions made regarding the use of resources by state enterprises also have an impact on aggregate demand and prices. While the CBC has operated since 1997 with some independence from the government, there are certain features in its charter that make it more susceptible to government pressures than other central banks. According to the Central Bank Law, one objective of monetary policy is to achieve the economic objectives of the country, which leaves the central bank with a too-open-ended agenda and subject to government influence. This is particularly serious given that top CBC officials do not have fixed-term appointments and serve at the pleasure of the government.5 In addition, decisions on monetary policy and on the financial sector by the CBC board have to be submitted to the government, making the CBC operate pretty much like another line ministry, reminiscent of the system of the former Soviet Union. Under the CBC’s charter law, the Council of Ministers has the authority to order the Central Bank to provide financing to the government, as has been the case when the government has run a fiscal deficit. As instruments of monetary policy, the CBC has used the exchange rate of the Cuban peso in the official foreign exchange market, interest rates of term deposits, and central bank sales of foreign exchange to the Ministry of Internal Commerce (MINCIN). MINCIN is in charge of the sales of goods and services to the population in Cuban pesos. Until 2002, the exchange rate policy of the CBC is described by Pavel Vidal as akin to a managed float, with the CBC selling or buying foreign exchange from CADECA.7 Since 2002, the exchange rate has been fixed, with one small appreciation in March 2005. More recently, in 2011, there was an 8% depreciation of the Cuban convertible peso (CUC) vis-à-vis the U.S. dollar, which returned the one-to-one parity between these two currencies. The CBC fixes the rate of interest in term deposits in pesos cubanos (CUP), pesos convertibles (CUC) and U.S. dollars. The fixed interest rates on deposits are higher for savings in Cuban pesos, to promote saving in domestic currencies and promote the stability of the exchange rate. The CBC believes that the interest rate on term deposits is an important monetary instrument because about half of the monetary liquidity of the Cuban population is maintained in savings accounts. Saving decisions could have a significant impact on the exchange rate or prices. The third most used monetary policy instrument is the sale of foreign exchange by the CBC to the MINCIN. The MINCIN can obtain foreign exchange to finance imports through two complementary systems: through an exchange allocation from the Ministry of Economics and Planning or by buying foreign exchange from the Central Bank. The CBC sells foreign exchange to the MINCIN at the CADECA exchange rate and this way hopes to affect domestic demand given the paramount role that MINCIN plays in the sale of goods and services in Cuba. A published and comprehensive balance sheet of the Central Bank over a number of years is not available to analyze its performance and its relations with the rest of the economy. This is one of the most important omissions regarding the availability of published statistics in Cuba. Cuba has tried to float bonds at the London Stock Exchange in the past and, recently a financial report of the Central Bank containing a partial balance sheet and a profit and loss statement for the CBC for the years 2009 and 2010 appeared in the London Stock Exchange website.9 The information provided shows a shrinking balance sheet for the CBC in 2010, a difficult year for Cuba. However, it is difficult to interpret this balance sheet because it is noted the BCB does not provide information on international reserves in this statement and no clarification is given on how the balance sheet is balanced (for example, are some liabilities excluded from the balance sheet too or are the international reserves part of the total assets shown in the statement?). The inflation performance, however, is not as clear cut as suggested by these numbers. The CUP inflation data is based on a basket of goods and services where 40% of the prices are controlled. The rest of the sample is 30% goods sold in the foodstuff markets and another 30% in the informal sector. No information is available to the author on how freely determined are the prices in the foodstuff and in the so called informal markets. In any event, the existence of 40% of controlled prices in the sample reduces the usefulness of this indicator. During the 2000s, there have been reports of increasing shortages of basic commodities whose prices are controlled and which are only available in the black market at many times over the official prices. Furthermore, no price data on the CUC market are published, a market which is increasingly important as more and more goods are only available to be purchased with CUCs. For example, in May 2011, it was announced that in new stores which are to be opened to sell construction materials to Cuban residents, sales will be made only in CUCs, and CUC prices have already been announced. Although fiscal deficits widened in 2008 and 2009 as a result of a negative terms of trade shock and a decline in tourist receipts, the authorities maintained the fixed exchange rate policy which helped provide a nominal anchor for prices. However, this policy may have also resulted in a significant rundown of international reserves of the CBC. During this period, it became clear that CUC bank accounts were not fully backed by foreign exchange. The CBC imposed restrictions on withdrawals from CUC accounts to buy foreign exchange, and foreign exchange payments done through the banking system were delayed for several months while previously it took only a few days to do. ECLA—the United Nations Economic Commission for Latin America—estimated that Cuba accumulated external payments arrears between US$600 to US$1,000 in 2008. From this perspective, although the exchange rate was maintained, Cuba’s performance was not very good given this accumulation of payments arrears that further deteriorated Cuba’s international creditworthiness. Evidence of the creditworthiness deterioration of Cuba is provided by the Bank for International Settlements (BIS), an institution that collects countryspecific information on loans issued by international banks from the most important countries in international finance. The BIS also collects country-specific deposits in international banks that report to the BIS. The BIS Quarterly Report of June 2011 shows that bank loans to Cuba declined sharply and steadily from December 2008 (US$2,849 million) to September 2010 (US$1,654 million) with some recovery by December 2010 (US$ 1,740 million). As noted by Luis Luis, the reduction of bank credits to Cuba has forced the country to pay cash for many of its imports that were previously financed by bank credit lines. This requires Cuban banks to post collateral deposits at international banks.11 The most recent BIS data shows this trend clearly. Deposits of Cuban banks in international banks have almost doubled from end 2008 to end 2010 reaching a level of US$5,387 million by December 2010. At the same time, the BIS data show that on a net basis, Cuban banks (including the CBC) increased their net foreign exchange position (Cuban deposits in foreign banks reporting to the BIS minus loans granted to Cuban banks) from US$1,015 million at end 2008 to US$3,647 million at end 2010. It could be that the accumulation of external payment arrears and the availability of external lines of credit from friendly countries made this possible, but without the complete balance sheets of the CBC and of the state banks it is not possible to know what has happened. Finally, no information is available regarding the performance of the CBC as supervisor of the banking system. The supervising function is key in ensuring the soundness of banks, so that they can provide efficient financial intermediation to promote economic development. This is particularly true in the case of Cuba where the banking environment may result in a situation where bank managers are not necessarily appointed on merit and lending decisions to state enterprises are not only made on financial considerations. In 1998, bank credits to individuals were approved, but this practice was discontinued after a few years. More recently, loans to individuals have been associated with national programs launched by the government, like the program to allow households to acquire more efficient electronic appliances. The funds were actually disbursed directly to the sellers of appliances and not to the borrowers. The latest published Annual Report of the CBC shows almost no growth in bank credit during the year 2007. González-Corzo notes that, as part of the bank reforms begun in the mid-1990s, progress was made in the automation of bank branches.14 This process of automation involved the training of bank personnel and the deployment of industry-wide computer networks. In 1998, a Public Data Transmission Network was implemented which facilitated the integration of the country’s banking sector and speeded up the transmission of data between main offices and their correspondent branches. By end-1998, all the Cuban banks involved in international transactions were directly connected to their foreign counterparties through SWIFT, the financial industry-owned cooperative providing messaging services across 200 countries.15 Automated teller machines (ATMs) are available outside some bank branches for the use of Cuban depositors. As with the CBC, there does not appear to be any publicly available financial information on state banks (e.g., balance sheets, profit and loss statements, or reports on compliance with capital requirements). The author does not have access either to prudential information. Anecdotal information suggests that state enterprises give high priority to servicing their bank loans, after meeting their payrolls, and that bank loans in arrears is not a significant problem. In addition to the problems that state banks had in processing foreign exchange payments abroad in recent years, there are reports that the state banks do not have much liquidity to expand bank credit. Indeed, the 2007 Annual Report of the Central Bank shows that bank deposits declined by 15% during 2007. At the present time, there are eleven representative offices of foreign banks in Cuba, from Spanish, French, and Canadian banks, among others, and four representative offices of foreign nonbank financial institutions. Within a restrictive regime, these representative offices of foreign financial institutions have been conducting credit operations and providing financial services to mixed and foreign enterprises. There are also nine state-owned nonbank institutions in Cuba including the already mentioned exchange house, CADECA, and an insurance company. Guideline 45: Monetary planning during the short, medium, and long term should aim at internal and external monetary equilibrium in a comprehensive manner. Internal equilibrium must refer to the demand and supply of money and the objective of keeping inflation low, while external equilibrium to a sustainable balance of payments position. Guideline 46: Monetary policy will be framed to control money in circulation and bank credits in line with the economic plan of the country in order to contribute to stability in the exchange rates and of the purchasing power of the domestic currency as well as to the orderly development of the economy. Exchange rate and price stability are monetary policy objectives in most countries, with an important difference being the reference to the economic plan of the country, which may prove to be an effective constraint to the autonomy of monetary policy. Guideline 47: In line with the monetary policy stance, adequate rules for the issuance of currency should be established and actions should be taken in line with the information provided by available indicators to control the issuance of currency. This guideline can be interpreted as an implementation of Guideline 46. Guideline 48: Structure the interest rate system in a more rational way, based on the existing economic conditions, and empower more the instruments of monetary policy to manage the short-term monetary conditions by strengthening the relations among the institutions of the national banking system. The intent regarding interest rates is clear, but unfortunately the principle is still based on the government setting interest rates directly. The original drafting of this guideline made references to developing an interbank market and to administrative credit controls, mandatory deposits of commercial banks at the CBC, and the regulation of interest rates and loans to financial institutions. However, this terminology was deemed too technical and the wording was changed to the more general one described above. But, clearly, the preoccupation is with the lack of an interbank market in Cuba. Guideline 49: Maintaining the growth of the quantity of money in line with the growth of retail sales in state stores (circulación mercantil minorista) will continue to be the key instrument to attain monetary and foreign exchange stability in the retail sector. The desire is expressed that this instrument be used as part of the economic plan. This guideline has to be viewed keeping in mind the point that monetary policy discussions in Cuba refer more to the liquidity position of the household sector, with considerations regarding the monetary conditions facing state enterprises being treated separately. Guideline 50: Implementation of a directed credit policy intended to give support to activities that generate foreign exchange or substitute imports, as well as to those that guarantee the economic and social development of the country. The objectives of this guideline are clearly meritorious but the key word is “directed” and the implication that the government will decide which sectors to promote. Guideline 51: Establishment of mechanisms and conditions necessary for facilitating the granting of credits and their collection. Undoubtedly, this is an important objective given that the expansion of bank credit has probably been too slow in recent years, but no clear indication is given how this is going to be done. Given the bad experience of the United States and other market economies when the government has intervened in the financial markets to promote certain types of loans (e.g., mortgages), caution should be used in establishing such mechanisms. Guideline 52: Increase and diversify the offer of credits to the population to finance the purchase of goods and services, taking into account the collateral needs of banks, the borrowers’ capacity to service loans, an adequate monetary equilibrium and the macroeconomic indicators of the economic plan. The need for the application of the principles embodied in this guideline is self-evident, which raises the question of why the guideline is needed at all. Guideline 53: Provide the necessary banking services, including the granting of credits to the non-state sector, to promote its adequate development, and study the possibility of creating savings (capitalization) accounts for the acquisition of equipment and other uses. This is an important guideline in the Cuban context because it endorses bank credits to the non-state sector. Guideline 54: Ensure an adequate relationship between the interest rates on bank deposits and the interest rates on bank loans. No information is given how this is to be provided; no mention of increased bank competition. Guideline 55: Make progress in monetary unification, keeping in mind labor productivity and the effectiveness of mechanisms of distribution and redistribution. Because of its complexity, the unification process requires rigorous preparation and execution. This guideline refers to the important distortions in Cuba’s exchange system. No indication is given on how fast or how this problem is going to be addressed. President Raúl Castro has talked in one occasion terms of 3–5 years.17 The reference to labor productivity is probably due to the fact that an expectation has been created in Cuba that when the exchange rates are unified, the resulting exchange rate will appreciate vis-à-vis the current CUP 24 = US$1, going back to the situation that existed in the 1980s. and hence the need to increase labor productivity to offset in part this expected appreciation. Some of the monetary guidelines constitute meritorious and internationally accepted monetary objectives. This is the case for example of Guidelines 45– 47. However, to the extent that they are to be implemented in the context of a socialist economy, with some degree of central planning, and with state enterprises receiving preferential credit treatment, the attainment of such monetary objectives will be more difficult. Monetary policy will not be autonomous and monetary decisions will be subordinated to decisions of the government. It was noted above how the charter law of the CBC makes that institution subordinate to government decisions and there is nothing in the guidelines to make the central bank more autonomous to carry out its monetary policy. Guideline 48, which highlights the need to make interest rates more rational and the objective of promoting an interbank market to improve the impact of monetary instruments, may have an inherent contradiction in proposing the pursuit of these two objectives, because the idea is still that the government will set the interest rates. Guideline 49 relates the quantity of money to the activities of the household sector, while making no reference to credit to the state enterprises or the government. A more global credit focus is needed in framing monetary policy. Guideline 50 advocates a directed credit policy and a policy of “picking the winners” in the tradable sector. Given the Cuban experience, as well as the international experience in general, this is an ill-advised guideline that may continue to result in a waste of resources. Guidelines 51–53 are to be welcomed in general, with their emphasis in promoting the expansion of credit to the private sector. This will be crucial for the development of the non-state sector in Cuba. Guideline 54 advocates the maintenance of a reasonable bank spread between deposit and lending rates, but it ignores the possible role that bank competition could play on this. Finally, Guideline 55, which calls for monetary unification falls short of what is needed. Already most of the population faces the devalued exchange rate of CUP24 = US$1, but importing state enterprises receive a huge subsidy with the availability of foreign exchange to them at the parity exchange rate. This is well known to the Cuban authorities, although they have not publicly recognized it. The call for gradualism in the guideline must be to accommodate a plan to reduce this subsidy to state enterprises over a number of years. However, given the seriousness of this distortion, it would be better to move faster in the process of exchange system unification. Increased transparency in banking sector information. Important first steps would be the regular publication of monetary statistics and of the Annual Report of the CBC. Monetary statistics would include a comprehensive Balance Sheet of the CBC and of state banks separately and consolidated in a monetary survey table, as well as bank information regarding prudential ratios and loan performance. Publication of this information will permit analysis of how financial savings have been growing in the economy and how effective the banking system has been in carrying out financial intermediation by extending credit. This information will also tend to promote an interbank market in Cuba. In the second decade of the 21st century, it is really shameful that this information is not available for Cuba. Increased transparency of official information will help Cuba gain more recognition internationally. The old excuse that secrecy is necessary because of national security reasons due to the U.S. embargo and the antagonistic behavior of the United States toward Cuba is increasingly outdated. Strengthen the operational autonomy and the accountability of the CBC by reforming the charter law that makes the institution dependent of government decisions. This includes defining more precisely the relations between the CBC and the Government, requiring accountability for the CBA’s actions to complement its new autonomy, including transparency and disclosure with respect to its objectives and performance. The central bank law should clearly identify as the primary objective the fighting of inflation (in an environment of freed prices). The focus on this primary objective does not mean that a central bank cannot pursue other secondary objectives, which could be supporting economic growth, maintaining financial stability through a sound banking system, and ensuring an efficient payments system. From an international best practice point of view, the CBC should handle all central banking functions and no commercial banking functions and the state commercial banks should do the opposite. Unify the exchange system by eliminating one of the two Cuban currencies circulating in Cuba (the CUP and the CUC), and adopting one exchange rate to eliminate the distortions due to the existence of two official exchange rates. Given the serious external disequilibrium that Cuba is facing, this step will need to amount to a large devaluation of the peso—the new rate will probably have to be close to the CUP24 = US$1, and the devaluation will have to be accompanied by a credit policy that avoids a price spiral. This step is not only necessary for improved resource allocation but also to promote financial savings given that the circulation of more than one currency in the economy and different exchange rates are not conducive to promoting confidence on the currency or bank deposits. As noted above, such a step could result in a major shock to many state enterprises which have been benefitting from a huge subsidy. Many of these enterprises may have to be closed, but it would stop the drain of resources that are badly needed in other sectors of the economy. Once a successful devaluation is implemented, the exchange rate policy will need to be a flexible one given the economic characteristics of the Cuban economy. A flexible exchange rate policy in the future will permit Cuba to use the exchange rate as an adjustment mechanism and avoid foreign exchange restrictions and deposit freezes that discourage foreign investment and depositors. Assess the soundness and liquidity of state banks and reconsider whether so many of them are needed. The performance of state banks across many countries has been quite poor, and Cuba is probably no exception. In this context it would be important to reduce segmentation of the banking system by encouraging competition on equal terms between state banks and foreign banks and eventually with domestic private banks whose opening should also be permitted. Differences in rules, regulations, instructions, and guidelines, if they exist, between state banks and private banks should be eliminated. Without sacrificing quality, weight should be given to increasing competition when granting licenses to new private banks. Prepare in consultation with foreign banks, international organizations (BIS, IMF) and bank regulators in other countries, actions aimed at strengthening the integrity and the governance of banks. Key attention should be paid to large bank exposures and connected lending activities, which should be avoided. Eliminate regulatory constraints on greater financial intermediation that serve no prudential purpose, and abolish excessively detailed regulation. Elimination of minimum and maximum interest rates on different types of deposits, and letting each bank set its own rates; elimination of the maximum interest rates on different types of bank lending and letting each bank set its own requirements based on its business strategy and its own risk assessment and risk acceptance level; relaxation of maximum levels on fees and commissions charged by banks; and relaxation or elimination of collateral requirements and letting each bank set its own requirements based on its own risk assessment and risk acceptance level. These changes should be accompanied by the adoption of sound prudential guidelines and oversight. Review the existing national electronic payment system to identify needs and ways to modernize it. The fact that most bank deposits in Cuba are savings accounts suggests that many transactions are done on a cash basis and ways should be sought to encourage other means of payments. Strengthen the financial infrastructure. (a) The existence of credit information systems is crucial for the growth of banking activities. In many countries there are public credit registries which are also complemented by private credit bureaus. Effective systems require the participation of a wide spectrum of market participants including banks, other financial institutions, and non-regulated lenders. The author does not know whether there is any credit information system in Cuba at the present time, but such an institution will become increasingly important as private sector activities are expanded and state enterprises are held to more strict financial requirements. (b) Collateral regimes should be strengthened by adopting a specific law that regulates every aspect of the chain of secured lending. The law should emphasize the following elements: the new secured transactions law should be broad (e.g., allow broad pools of assets with a generic description of the assets to be accepted as collateral); creation of security interests in movable property should be simplified and movable collateral registries should be modernized; and enforcement must be substantially strengthened, especially through the introduction of effective out of court enforcement mechanisms. (c) Establishment of an effective insolvency regime with effective reorganization and liquidation procedures. This will require an improvement in the judicial system. Efforts should be made to develop microfinance and alternative sources of finance for small and medium enterprises (SMEs). With the emphasis in promoting small scale entrepreneurship activities in Cuba (cuentapropistas), it is imperative to promote microfinance institutions operating under a sound credit information environment, as suggested above. This is best achieved by integrating microfinance institutions into public credit registries or private credit bureaus, rather than relying only on microfinance information-sharing systems. Over time, well performing microcredit non-governmental organizations should have an option of graduating to regulated financial institutions. The legal framework for leasing and factoring operations should be reviewed making sure, for example, that the process for registering leased assets is appropriate so that lessors may publicize their interest in the leased asset and protect its ownership rights and that repossession procedures are easily implemented. Leasing and factoring operations have proven to be important sources of financing for small and medium size enterprises in many countries. As a first step to develop money and capital markets, domestic government obligations like Treasury bills should be made into liquid and market based securities with more competitive rates of return (with the liberalization of interest rates having taken place). In the short term, the interest rate on Treasury bonds should be raised above the level of the interest rates on bank deposits to give banks a more interesting asset for a wider use. At the appropriate time, the Treasury bond maturities should be increased. Over time, this could facilitate the establishment of a market-based yield curve which could provide the necessary reference for the development of private sector instruments. 1. The author is indebted to the writings of Mario González-Corzo and Pavel Vidal Alejandro that have provided indispensable background information on the Cuban banking system, and to the technical advice on banking reforms of Åke Lönnberg, a former colleague from the International Monetary Fund. Luis Luis provided valuable comments in interpreting economic developments in Cuba. 2. Mario González-Corzo provides a description of the banking sector reforms in his “Banking Sector Reforms,” in Mauricio Font (ed. ), Cuba Today: Continuity and Changes since the Periodo Especial. New York. Bildner Publications, CUNY, 2004. 3. See González-Corzo (op.cit) for a description of the approved functions of the Central Bank of Cuba and of the other state banking institutions. 4. Pavel Vidal Alejandro, makes this important point in “Política Monetaria” in Omar Everleny Pérez Villanueva and others, Miradas a la Economía Cubana II (Editorial Caminos, La Habana, 2010). 5. See Lorenzo Pérez, “Assessing Fiscal Management and Central Banking in Cuba and Proposals for Improvement,” Cuba in Transition—Volume 16 (2006) for an assessment of the central bank law from the perspective of best central bank practices. 6. Vidal Alejandro, “Política Monetaria: 1989–2009,” in Omar Everleny Pérez Villanueva, editor, Cincuenta Años de la Economía Cubana (2010), and his chapter on monetary policy (op. cit) in Miradas a la Economía Cubana II, have a good discussion of the functions of the CBC and the banking system. 7. Vidal Alejandro, op. cit, in Cincuenta Años de la Economía Cubana, pp. 158–159. 8. Vidal Alejandro, “La reforma cubana: tres objetivos para la política monetaria y cambiaria,” Estudios Empresariales (Universidad de Deusto), no. 136 (2011), pp. 61–70. 9. http://www.rns-pdf.londonstockexchange.com/ms/2754J—2011–6–28.pdf. Interestingly, no reference is made to this document in the website of the CBC. 10. Vidal Alejandro, “Política Monetaria,” in Miradas a la Economía Cubana II, page 32. 11. 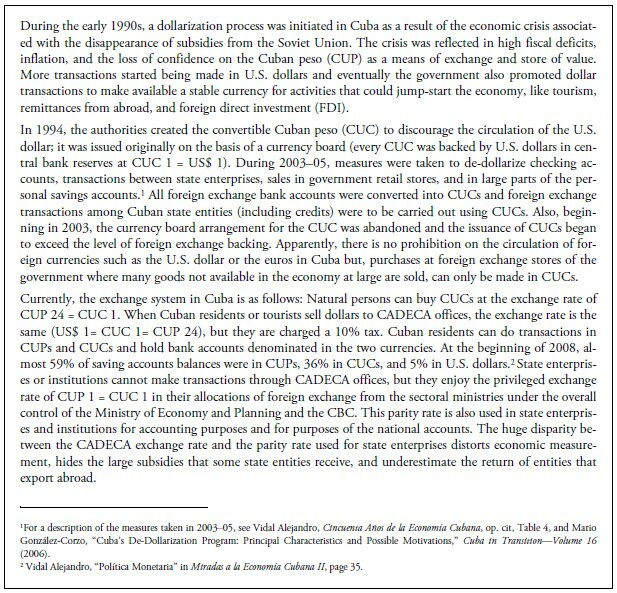 Luis Luis, “Crisis Management of Cuban International Liquidity,” Cuba in Transition—Volume 20 (2010). 12. Central Bank of Cuba, 2007 Economic Report, published in May 2008. 13. Vidal Alejandro, “La reforma cubana,” op. cit, 2011. 14. González-Corzo, “Banking Sector Reforms,” op. cit. 15. Unfortunately, there may be a problem in Cuba continuing to use the SWIFT facilities beginning on March 31, 2012, because of the adoption by SWIFT of new software developed in the USA. The USA developer of this software would be subject to sanctions according to American laws if the software were made available to Cuba. 16. The guidelines are not translated literally in this paper. The author has attempted to put them in a language that is more understandable in economic terms. 17. Vidal Alejandro, “La reforma cubana,” op. cit. 18. Lorenzo Pérez, “Liberación del empleo en Cuba,” Palabra Nueva (Noviembre 2010). 19. The recommendations which follow owe a lot to the advice of Mr. Lönnberg, who shared with the author his technical assistance experience in the banking area, and to the World Bank document, Financial Access and Stability for the Mena Region-A Roadmap (March 2011).